Two years after Champlain's fruitless journey up the Ottawa he again set out to further explore the country in that direction. 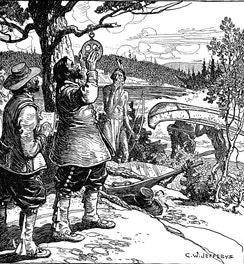 In the summer of 1615 he met the northern and western Indians, the Algonquins and Hurons, at the junction of the Ottawa and St. Lawrence, where every year they brought their furs to barter them for European goods. The Indians begged him to aid them against their deadly enemies, the Iroquois, who beset the route, killing or taking them prisoners, and capturing their furs, which they carried off to the Dutch traders at Albany. Champlain agreed to assist them, on condition that they would allow him to visit their country, and would receive missionaries to live among them. With him was Father Le Caron, a priest of the Recollet branch of the Franciscan Order, who, with three others had come out as missionaries that spring. When the trading was over, the priest and twelve well-armed Frenchmen travelled with the Hurons on their journey to their distant homes on the shores of Georgian Bay. Champlain with two other Frenchmen and ten Indians followed them a few days later. Their route was up the Ottawa and by way of Lake Nipissing and French River to Lake Huron, thence south among the islands to Penetanguishene, where they went ashore and struck inland to the Huron villages. Father Le Caron and his French companions, therefore, were the first white men known to have seen Lake Huron. On the 12th of August the little company of Frenchmen met together again after their journey, and assisted at the mass, celebrated for the first time within the limits of the present Province of Ontario, by the Recollet priest, at the Indian village of Carhagouha, near where Lafontaine stands to-day, in Simcoe County. After visiting numerous villages, Champlain proceeded to Cahaigue, the largest Huron town, situated close to Lake Simcoe, near the modern Hawkestone. Here were gathered the warriors of the nation to consult with him and make plans for an attack upon the Iroquois in their own country. It was decided that the Hurons, accompanied by Champlain and his Frenchmen, should invade the Iroquois stronghold from the north, while five hundred men of the Andastes, allies of the Hurons, living in what is now Pennsylvania, were to advance from the south-west and join in the attack. Etienne Brule, Champlain's young interpreter, was sent to the Andastes' country to hasten them forward. Early in September, the Hurons, with some Algonquin allies, set forth on their expedition. Their course lay from Lake Simcoe through the Kawartha Lakes and the Trent Valley, and across the eastern end of Lake Ontario. Landing on the southern shore they proceeded inland to the palisaded town of the Onondagas, a few miles south of Oneida Lake, in the New York State of to-day. The Huron attack was disorderly; Champlain found it impossible to maintain discipline or organization, or to induce them to press the siege vigorously. Many of the Hurons were killed or wounded, Champlain himself was disabled by two arrow wounds, and the Andastes had not arrived. After waiting for five days, the discouraged Hurons withdrew, carrying Champlain and their other wounded in baskets hastily made on the spot. A few days later the Andastes reached the meeting place, but finding the besiegers gone, they, too, returned to their own country. 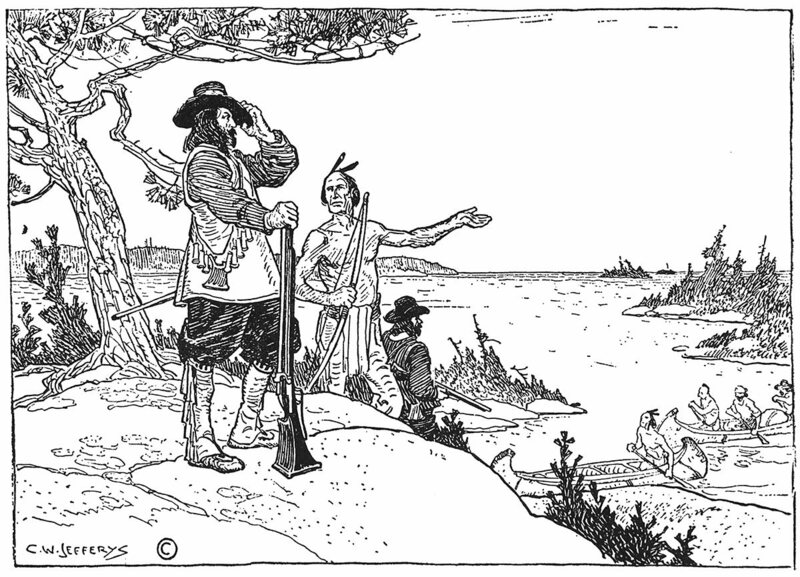 Champlain wished to proceed direct to Quebec, but the Indians refused to lend him a canoe, and he was forced to go back with them to Huronia. They travelled slowly, stopping frequently by the way to hunt, and it was winter before they reached their homes. For some days Champlain suffered greatly from his wounds, but at length recovered, and was able to take part in the hunting. Wild fowl and deer were plentiful, and on one occasion, following a strange bird, Champlain lost himself in the woods for two days. 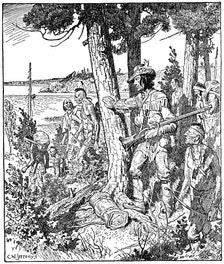 Champlain spent the winter in the Huron villages, and next spring, with some of the Indians, made his way back to Quebec, where he was welcomed as one returned from the dead. His explorations were over; he was now forty-nine years of age, and doubtless his life of constant travel, warfare and exposure had left its mark upon him. Henceforth the care of the infant colony claimed all his energies for the nineteen years of his life that still remained. 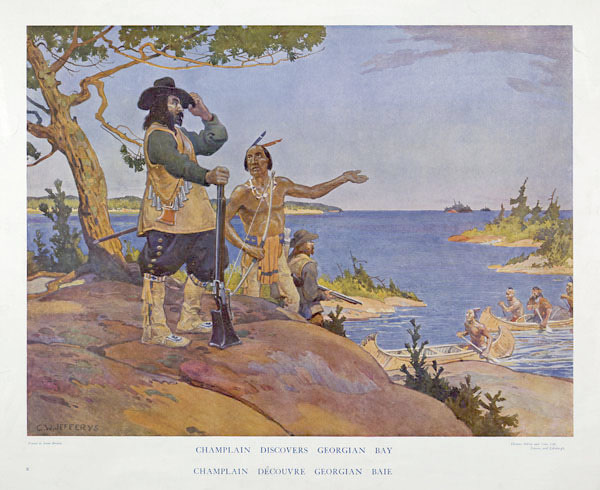 The picture shows Champlain looking out over the lake to the west, from one of the many islands that fringe the shore of Georgian Bay, while one of his Huron guides points out the course to him. He is armed with an arquebus, and over his shoulder is slung a bandoleer, to which are attached small tin or wooden cases, something like modern cartridges, each containing a charge of gunpowder. To load the weapon, one of these cases was detached, the top torn off, and the powder poured into the muzzle of the arquebus; a bullet was taken from the bag which hangs below the bandoleer and dropped into the arquebus, and pounded firmly down with a ramrod. From a flask which hangs near the bullet-bag, a small quantity of finer powder was poured into the touch-hole at the breech of the arquebus, and it was then ready to be fired by contact with the lighted fuse. Over Champlain's shoulder is slung a bandoleer, to which are attached small tin or wooden cases, something like modern cartridges, each containing a charge of gunpowder. To load the weapon, one of these cases was detached, the top torn off, and the powder poured into the muzzle of the arquebus; a bullet was taken from the bag which hangs below the bandoleer and dropped into the arquebus, and pounded firmly down with a ramrod. From a flask which hung near the bullet bag a small quantity of finer powder was poured into the touch-hole at the breech of the arquebus, to be fired by contact with the lighted fuse. Catalogue of the Exhibition of the International Exhibition of Modern Art assembled by the Societe Anonym, The Canadian Society of Graphic Art, and historical paintings and drawings by C.W. Jefferys, R.C.A.,O.S.A, April Nineteen Twenty-Seven. Toronto, Art Gallery of Toronto, 1927. 32 p. Illus. Cranston, J. Herbert. Etienne Brule: immortal scoundrel. Toronto, Ryerson, 1949. 144 p. Illus. Cranston, J. Herbert. Huronia: cradle of Ontario’s history. Minesing, Ont., Huronia Historic Sites Association, 1949. 80 p. Illus. 6th ed. nd. Rumney, George R. “The Ottawa-Nipissing canoe route in early western travel.” In Canadian Geographical Journal, v. 42, no. 1, Jan. 1951, 26-34. Illus. MacInnis, Craig. “Beers ‘R’ Us.” In Toronto Star, Oct. 20, 1990, p. E1-E8. Illus. Fleming, R.B. “Champlain and the Portage Road in 1615.” In Jones, Elwood H. et al. Finding Champlain’s dream. Peterborough, Trent Valley Archives, 2015. 96 p. Illus. Fleming, R.B. “Samuel de Champlain and the Portage Road in 1615.” In Heritage Gazette of the Trent Valley, vol. 19, no. 4, Feb. 2015, 3-6, 43-44. Illus.